Prices move in trends, and these trends tend to continue in the same direction for extended periods of time. The technical analyst, through the use of charts and other indicators, attempts to identify these trends. The charts do not cause the market to go up or down. They simply reflect the market's perception of the fundamentals. In essence, it is a matter of cause and effect. Fundamental analysis seeks to interpret cause, while technical analysis interprets effect. The fact that XYZ's earnings continue to grow is the fundamental cause for higher stock prices while the actual price range in which XYZ finds support and resistance is the effect. When we look at a chart, even a novice can see that markets fluctuate up and down in a succession of peaks and troughs. If the peaks are getting higher and higher, the trend is said to be up. Conversely, if the troughs are getting lower and lower, the trend is down. Sometimes, both of these trends are evident at the same time. This is a mixed trend and indicates a market trying to decide whether to continue the previous trend or establish a new one. A line can be drawn between successive peaks or troughs to graphically illustrate the trend. It takes two points to define a trend and a third to confirm. The top line is termed the line of resistance and the line connecting the troughs is termed the support line. Trends are most often broken down into three categories -- primary, secondary, and minor. 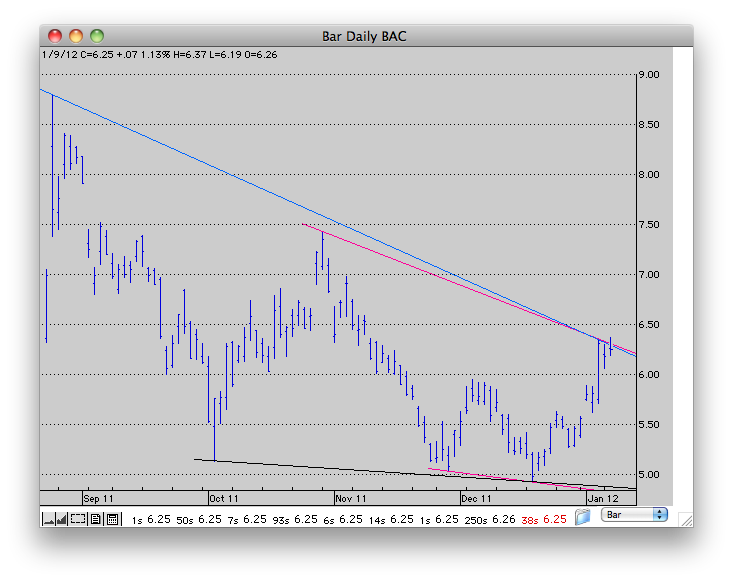 Identifying the trend and the magnitude of the trend are the key to chart analysis. One of the oldest sayings on Wall Street is "the trend is your friend." Automatic Trend Lines created using Pro Analyst from Trendsetter Software. Trend Lines are a visual portrait of the market's sentiment about a stock. If the stock is trending up, the market sentiment is to buy and the bulls are said to be in control. If the stock is trending down, the bears have taken command and the sentiment is to sell. When a stock is trading in a range, the bulls and bears are fighting for control. Trend Lines are straight lines that identify important support and resistance levels. Trend Lines show how fast or slow a trend is changing. You can read a stock&apos;s Trend Lines and use the information to find potential buy and sell points. All of Trendsetter's software products can identify and draw Trend Lines without assistance on bar, candle or line charts. In the thirty plus years our products have been on the market, no other company, on any platform, has been able to duplicate this capability.